The magazine is the key print medium of the twentieth century. It occupies that void between the ephemeral newspaper and the permanent book. It can be both a disposable information source and a collectable art object. In one way or another it is a vital source of fact, opinion and style. Its powerful combination of word and picture is equalled only by that of film. (The magazine and film are close cousins of the same age, as are the magazine designer and the film director). It is therefore amazing that a book such as Magazine Design has never appeared before, although there are endless thick volumes, usually thin on content, available on every other conceivable area of design. That the magazine, which many would consider the most visually exciting, intellectually demanding and ubiquitous form of print, has never been the subject of a serious design history makes one wonder how publishers in this field stay in business. With some inevitable and understandable shortcomings, William Owen has provided us with a handsome piece of work with which to fill this vacuum. The book is divided into two equal sections. The first is a well-paced history of the magazine from its gradual birth, around the turn of the century, up to the mid-1980s. The second section, under the title of ‘New Magazine Design’, is given as many pages as the first to show a selection of the more innovative work from the last five years. So what’s new about it? Owen asks himself this question in his preface and has to admit that ‘at the moment, there is no more than a hint of the new’. The fact that many of these examples are among the first to use computer-aided design (hopefully increasing productivity) cannot possibly justify expanding the last six per cent of the book’s historical coverage to fill 50 per cent of its pages. This is the first of two major criticisms I have of the book. Owen seems well aware of the unique deadline and budgetary problems of the magazine, but tends to neglect the benefits of the creative relationship between designer and editor. His writing is accurate, comprehensive and informed, if a little heavy on jargon (dangerous in such a wide field, where there is no universal trade-speak). Clearly the result of must meticulous research, the text really comes alive where Owen has been able to interview the original protagonists. I was interviewed during the preparation of the book and I will use myself as an example to make my second criticism. Owen goes into great detail about, and has much praise for, my weekly covers for Time Out magazine. 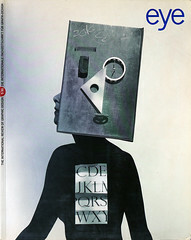 The text centres on the importance of the narrative covers, produced on a weekly basis, but to illustrate this, only one of the covers is shown. Owen has even elevated me to the level of those who were, until I read this, just distant heroes from the previous generation: ‘we rarely see today anything to compare with the art of Rand, Wolf, Lois, Marchbank…’ Rand? Wolf? But Lois, too? George Lois, coming from New York advertising, brought a completely new approach to magazine cover design on Esquire in the late 1960s and early 1970s. His work sparked off a challenge in me (as it had done earlier with David Driver on Radio Times) to make even the most apparently boring subject exciting. Though described at length in the text, not a single cover by Lois is illustrated and this is the fate suffered by much message-first, as opposed to style-first, work in the book. Wouldn’t it have been better to show a run of covers, of any magazine, even very small? This would have demonstrated the unique, issue-by-issue effects that are only possible with magazines. Similarly, an entire magazine (or run of spreads) reproduced page-by-page in miniature, as a flat plan, would have shown the dramatic sequential effects which are possible, as Willy Fleckhaus demonstrated in Twen (see Eye no. 3 vol. 1). A magazine is not a collection of clever, one-off designs within isolated pages. Given that the criteria for inclusion in this book seems to have been weighted on the side of the sexier (in the editorial and typographic sense), the more stylistic and the currently fashionable, this book does, however, form a valuable and essential collection. Reproduced here for the first time are some of the greatest and most vital examples of graphic design this century. Among the real eye-openers are Fortune magazine’s output in the 1940s (see also Eye no. 2 vol. 1) which, when compared to the work of, say, Spy, again poses questions about the validity and extent of the book’s second section. It is not so much a question of being ‘new’ as being right for the job, right for the times. The book itself is cleverly designed by Esterson Lackersteen in a timeless way that, thankfully does not compete with the wide spectrum of work that is presented – and how good to see text set in Futura. It is very well produced and fairly priced. If you are interested enough in magazine design to have read this review, then you should buy this book. Let us hope that it does not remain the only one of its kind for long.